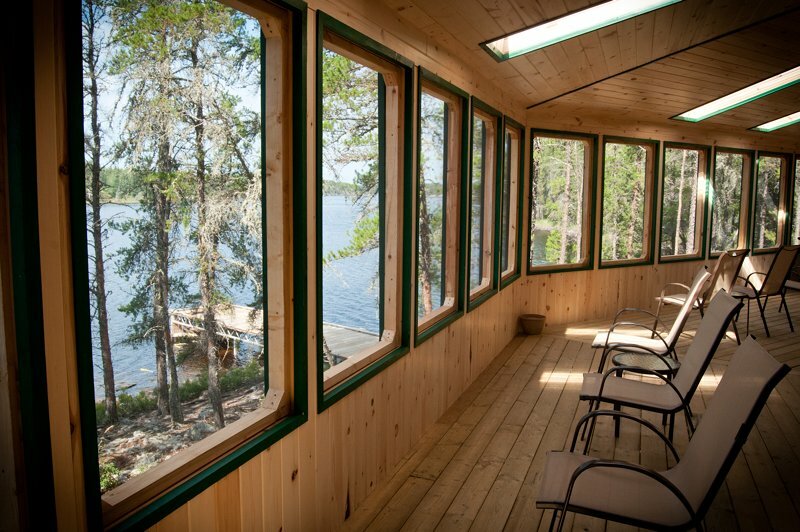 Since writing the below article about the new Lost Lake Outpost at Aikens Lake Wilderness Lodge in Manitoba, I had the chance to visit the one-of-a-kind cabin for myself. I got a chance to see first-hand just how unique this cabin truly is––and how it is in fact defining a new genre of "luxury outposts." 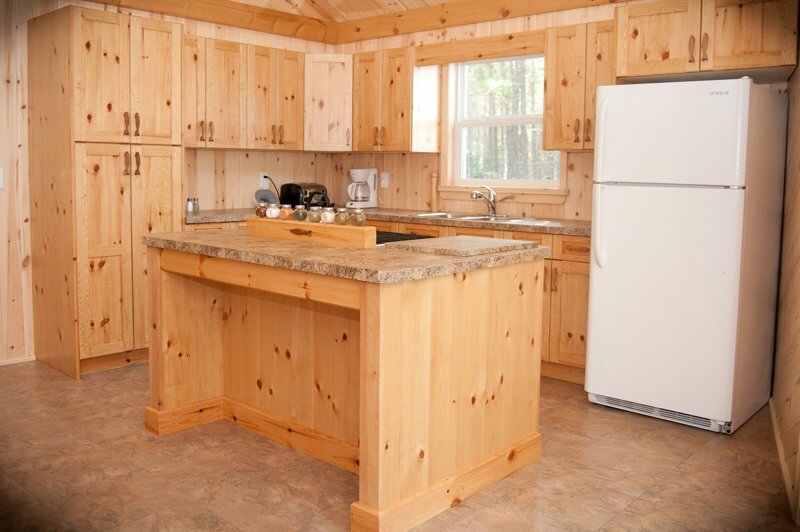 For starters, I can't say I've ever been inside an outpost cabin with granite countertops before. IIt's surprising that such exquisite detail and worksmanship can be found in such a wonderfully remote region. You have to fly through Manitoba's unspoiled Atikaki Wilderness Provincial Park to reach Aikens Lake Wilderness Lodge. From the base camp, Pit Turenne's crew zips you across Aikens Lake to this beautiful cabin that sits––as if posing for a postcard––with Aikens Lake in the foreground and Lost Lake in the background. The fireplace is magnificent, and the woodwork is amazing, but it's the porch that steals the show. 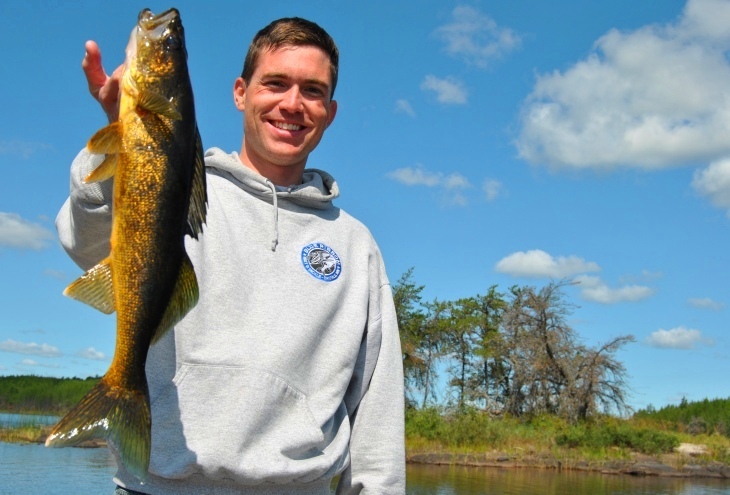 Of course, one can't forget about the fishing, so my dad and I quit drooling over the cabin and headed out on the mile-and-a-half lake that's produced a 33-inch walleye in the limited hours it's been fished (the full story below reveals this outpost just opened mid-2013). In the couple hours we pitched jigs tipped with frozen minnows, we caught pike and abundant walleye. 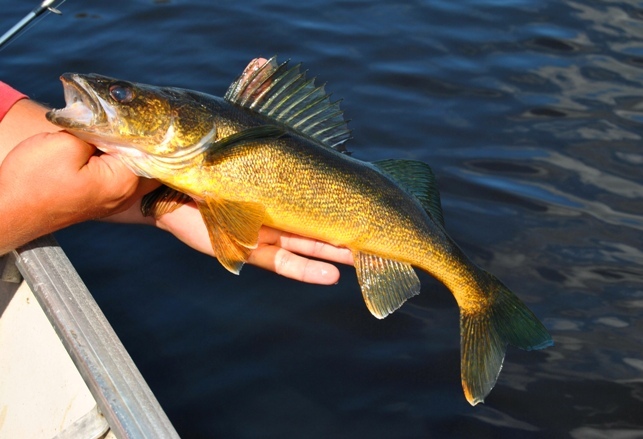 The walleyes' unique, dark gold coloring was fascinating. 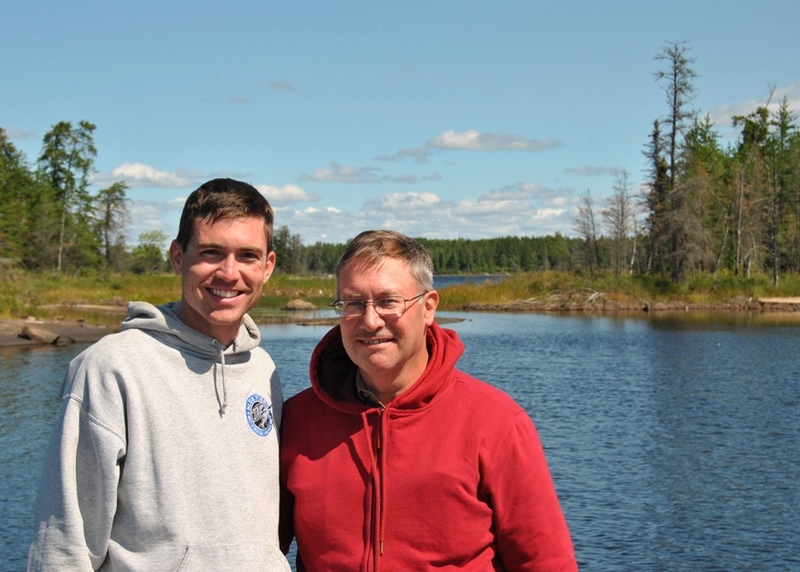 My favorite photo from our afternoon on Lost Lake is below, with my dad and I enjoying the day on the beautiful lake with the remarkable cabin. Below is the full story on Lost Lake. Check it out to see how this previously un-tapped gem is creating a new genre of fly-in outpost camps. 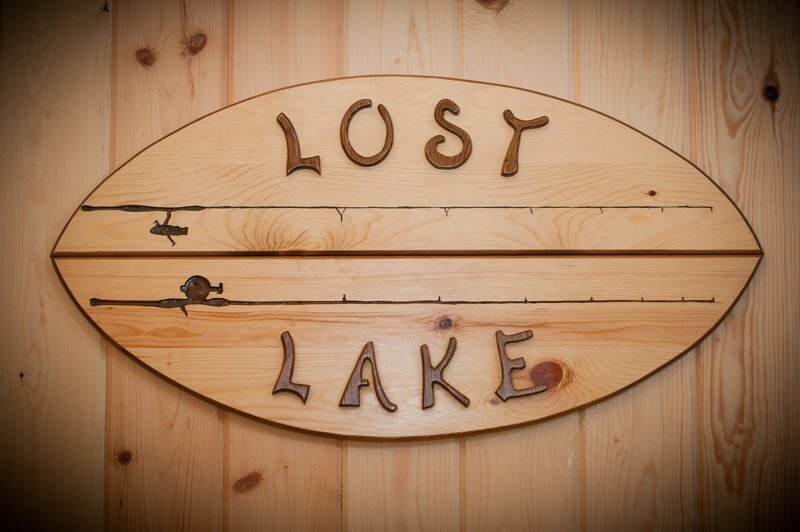 A dream that began two decades ago, on a hidden walleye gem aptly named Lost Lake, will come to fruition this month and break open a new genre of fly-in outpost camps. 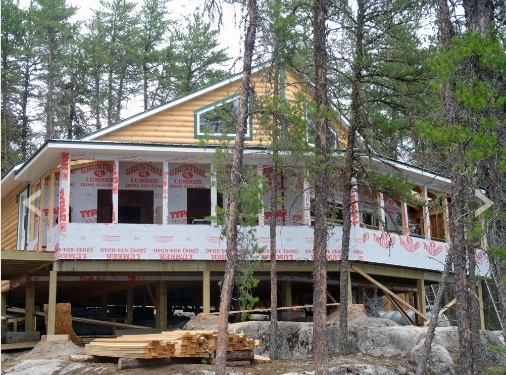 Today, only the final, finishing touches remain on Lost Lake Outpost––a remote outpost at Aikens Lake Wilderness Lodge that presents an unusual proposition to its future guests: an isolated experience in Manitoba’s Atikaki Wilderness Provincial Park on an lake that’s been virtually un-fished, while housed in one of the finest, luxury cabins imaginable. 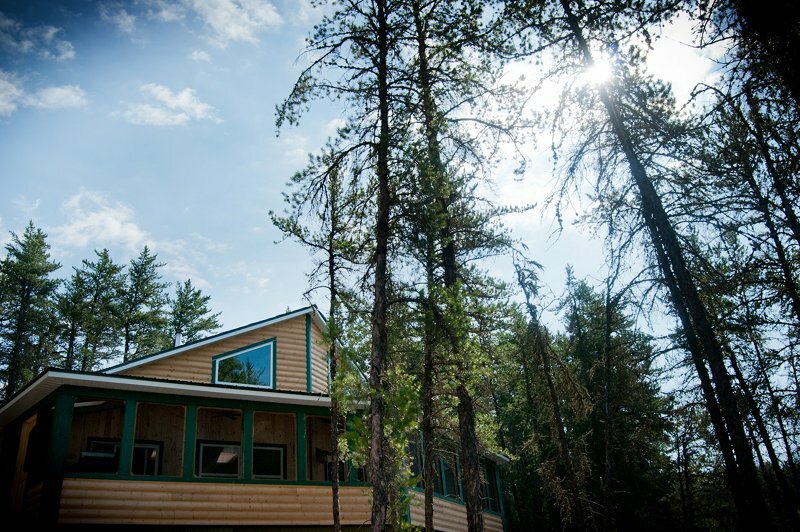 The 1,320-square-foot cabin, intended for groups of four to eight, features four bedrooms, two bathrooms, two showers, a dining room, full kitchen, and the largest screened-in porch in Atikaki Park. All this, on a moss-covered peninsula with a dock on one side out to Aikens Lake and a dock on the other side to the previously buried Lost Lake. 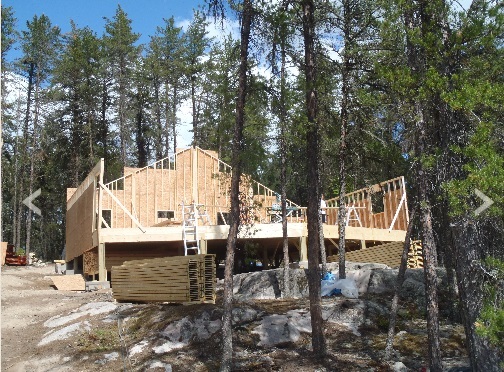 It’s also going to be the last cabin ever built in Atikaki Provincial Park. A moratorium went into effect August 1 halting any expansion inside of the park, as the region is applying to become a UNESCO World Heritage Site. Turenne’s parents, the previous owners of Aikens, brainstormed the idea for the outpost in the ’90s and applied for the original permit in 2001. At the time, Park management was fine-tuning its plan for the beautiful boreal forest, so approval was postponed. 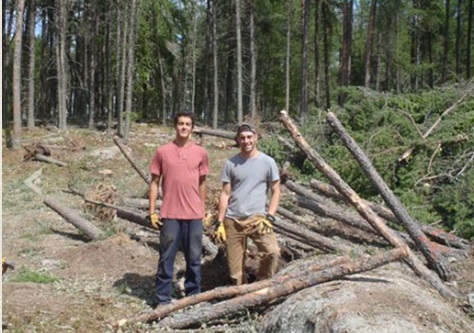 Last fall, the guides and crew cleared the area to prepare for construction. 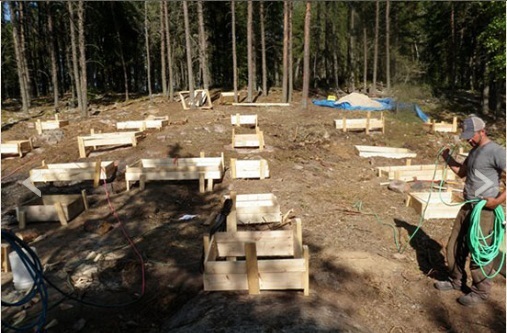 With winch, chain, shovels, picks and hoes, they muscled over 50 trees out of the ground––stump, roots, and all. Not surprisingly, the fishing guides actually prefer catching walleyes to ripping trees out of the ground, hauling them away and chopping them into firewood, but nonetheless they all chipped in and the clearing got done to pave the wave for spring construction. Only problem is, spring didn’t come to Aikens this May. Instead, more snow did. A historically late ice-out delayed Turenne and company by over two weeks, but eventually the crew was able to fly into camp and get to work. Building in a remote location presents a host of logistical complications. 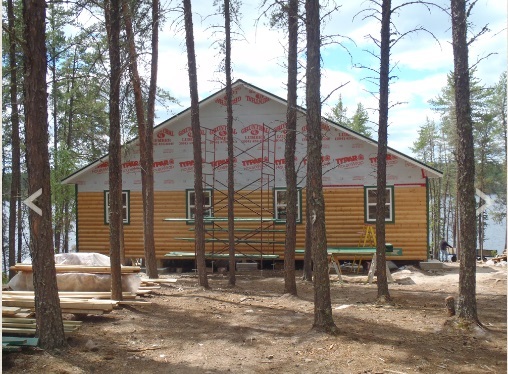 Despite a busy summer with guests at Aikens’ existing accommodations, the crew buckled down and Turenne said they’ll be 100 percent ready for their first Lost Lake Outpost guest on August 19. Previous Aikens guests include Vice President Dan Quayle, actor Rick Schroeder, countless professional athletes including NFL quarterback Boomer Esiason, and In-Fisherman’s Doug Stange. 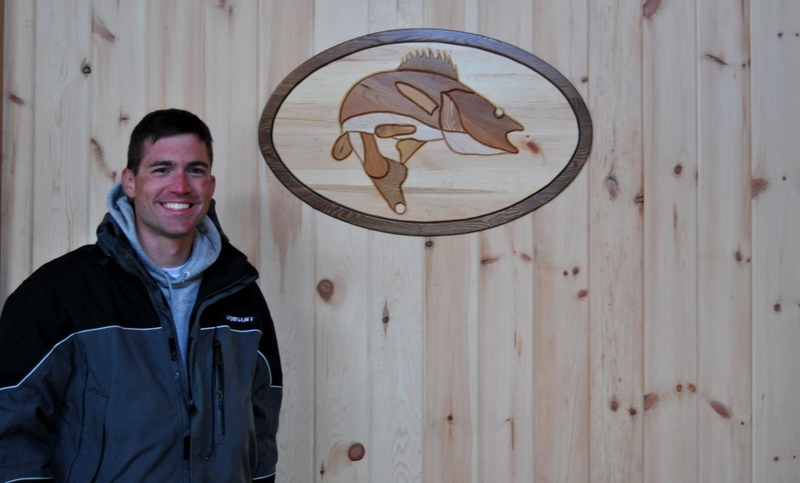 In fact, Stange, called Aikens “still the finest all-around fly-in experience I’ve ever had.” But the first guest at the new outpost will be a “regular,” not a celebrity, and any angler wishing to book the new cabin can do so simply by picking up the phone and giving Aikens a call at 800.565.2595. “It’s a wide open slate for 2014 so groups that want to slide into a preferred timeslot can be the first to claim it,” Turenne said. Those who do will be claiming a distinctly different experience than staying at the lodge, which is famous for its 5-star service and for having more staff on-hand to take care of guests than actual guests––a rarity in the fishing lodge world. Of course, there’s one minor detail left to be discussed about the new camp. It’s a question that's of great concern to all guests, whether they choose the most pampered plan at the main lodge or the most isolated option at the new outpost. The website for Aikens Lake Wilderness Lodge is www.aikenslake.com. For more information, call 800.565.2595 or email fishing@aikenslake.com.